E-cowlboy seat covers protect your original interior from damage, cover up any existing damage.They’re designed not only to protect your seats in the future years, but also to improve your driving comfort with additional cushioning. Car seat heating and ventilation functions can be used normally when install it. Compatible with air bags to provide you safety. All seat belts be accessed in the backseat. There are pockets on the back and a small pocket between your legs. The rear covers also have a small pocket in the middle. You can put some small stuff inside to provide your car neatly. This cover set uses natural environmental Luxurious PU leather with soft composite sponge, smooth and delicate feeling, can be used to clean water and dry. Most of the bottom and backs are woven cloth (poly). Only the sides, top and pillows are leather / vinyl. 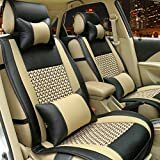 Much cooler than factory leather seats, it is not gonna be too hot to sit on.Comfortable and soft, suitable for year round use. This seat covers are designed well to prevent your original interior from damage, cover up any existing damage. They also will improve your driving comfort with additional cushioning.